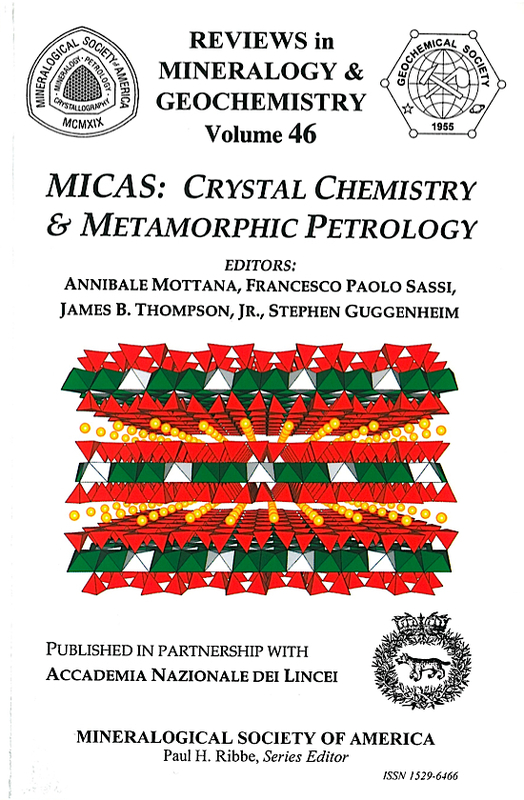 The editors and contributing authors of this volume participated in a short course on micas in Rome late in the year 2000. It was organised by Prof. Annibale Mottana and several colleagues (details in the Preface below) and underwritten by the Italian National Academy, Accademia Nationale dei Lincei (ANL). The Academy subsequently joined with the Mineralogical Society of America (MSA) in publishing this volume. MSA is grateful for their generous involvement. Micas are among the most common minerals in the Earth crust: 4.5% by volume. They are widespread in most if not all metamorphic rocks (abundance: 11 %), and common also in sediments and sedimentary and igneous rocks. Characteristically, micas form in the uppermost greenschist facies and remain stable to the lower crust, including anatectic rocks (the only exception: granulite facies racks). Moreover, some micas are stable in sediments and diagenetic rocks and crystallize in many types of lavas. In contrast, they are also present in association with minerals originating from the very deepest parts of the mantle-they are the most common minerals accompanying diamond in kimberlites. The number of research papers dedicated to micas is enormous, but knowledge of them is limited and not as extensive as that of other rock-forming minerals, for reasons mostly relating to their complex layer texture that makes obtaining crystals suitable for careful studies with modern methods time-consuming, painstaking work. the use of polytype suffixes based on the modified Gard symbolism created better ways of determining precise stacking sequences. This resulted in new polytypes being discovered. Indeed, all this has happened over the past few years in an almost tumultuous way. It was on the basis of these developments that four scientists (B. Zanettin, A. Mottana, F.P. Sassi and C. Cipriani) applied to Accademia Nazionale dei Lincei-the Italian National Academy-for a meeting on micas. An international meeting was convened in Rome on November 2-3, 2000 with the title Advances on Micas (Problems, Methods, Applications in Geodynamics). The topics of this meeting were the crystalchemical, petrological, and historical aspects of the micas. The organizers were both Academy members (C. Cipriani, A. Mottana, F.P. Sassi, W. Schreyer, lB. Thompson Jr., and B. Zanettin) and Italian scientists well-known for their studies on layer silicates (Professors M.F. Brigatti and G. Ferraris). Financial support in additional to that by the Academy was provided by C.N.R. (the Italian National Research Council), M.U.R.S.T. (the Italian Ministry for University, Scientific Research and Technology) and the University of Rome III. Approximately 200 scientists attended the meeting, most of them Italians, but with a sizeable international participation. Thirteen invited plenary lectures and six oral presentations were given, and fourteen posters were displayed. The amount of information presented was large, although the organizers made it very clear that the meeting was to be limited to only a few of the major topics of mica studies. Other topics are promised for a later meeting. 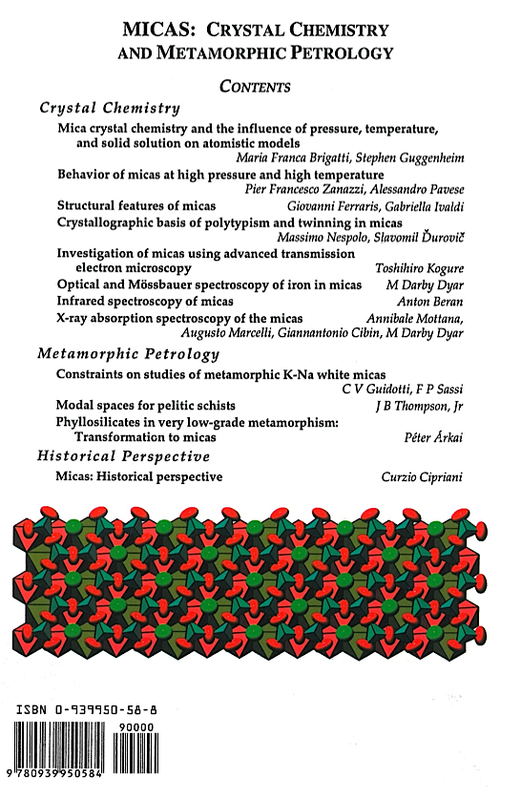 Oral and poster presentations on novel aspects of mica research are being printed in the European Journal of Mineralogy, as a part of an individual thematic issue: indeed thirteen papers have appeared in the November 2001 issue. The plenary lectures, which consisted mostly of reviews, are presented in expanded detail in this volume. This book is the first a co-operative project between Accademia Nazionale dei Lincei and Mineralogical Society of America. Hopefully, future projects will involve reviews of the remaining aspects of mica research, and other aspects of mineralogy and geochemistry. The entire meeting was made successful through a co-operative effort. The editing of this book was achieved by a co-operative effort of two Italian Academy members from one side, and by two American scientists from the other side, one of them (JBT) being also a member of Lincei Academy. The entire editing process benefited from the goodwill of many referees, both from those attending the Rome meeting and from several who did not. In all cases the reviewers were distinguished experts of the international community of mica scholars. Their work, as well as our editing work, were aided greatly by RiMG Series Editor, Professor Paul Ribbe, who continuously supported the effort with all his professional experience and friendly advice. We, the co-editors, thank them all very warmly, but take upon ourselves all remaining shortcomings: we are aware that some shortcomings may be present in spite of all our efforts to avoid them. Moreover, we are aware that there are puzzling aspects of micas that are unresolved. Please consider all these as possible avenues for future research!